After a bit of searching, I found this article on TechNet, which advised in setting the trust level to full for the web.config files, clearing out ASP.NET temporary files, and a few other things. None of these solutions worked. However, in the comments of the same article, someone had noted to setting the following registry setting, adding a DWORD (32-bit) value of 1 under a new key named LoaderOptimization in HKEY_LOCAL_MACHINE\SOFTWARE\Microsoft\.NETFramework. And also doing the same under HKEY_LOCAL_MACHINE\SOFTWARE\Wow6432Node\Microsoft\.NETFramework. Rebooted the servers, although I am sure an IIS reset, and a manual restart of all of the services would have done the trick, but the Farm was down, so a reboot wasn’t an issue to perform. "This situation usually happens when the SharePoint site web.config is set to use the legacy CAS model. The legacy CAS model was introduced in .NET version 4, and provokes the error. Refer to https://msdn.microsoft.com/en-us/library/vstudio/dd984947(v=vs.100).aspx for a reference of CAS changes in ASP.NET 4." I am not exactly sure what prompted this issue, except that there were some recent security updates applied, but this did the trick. I’ll have to dig into this deeper as time permits and see if I can determine the root cause. Sometimes the need arises to create separate Service Application Proxy groups in SharePoint. Starting with SharePoint 2010, you’ve been able to do this. In SharePoint 2007, you would have created different Shared Service Providers. Your needs might be, that you are exposing web applications to a different group of users, and need separate applications such as Search and the User Profile Service. This also allows you to run those service applications under different accounts, if you needed to for security reasons. First, let’s create the proxy group we want to use. And lets give it a name.. in the example, I’ll be using "Redacted"… because all my screenshots have had the real service application group identity redacted 🙂 But you can name this anything you’d like. Load up the SharePoint Version Management Console… and call the New-SPServiceApplicationProxyGroup PowerShell cmdlet. 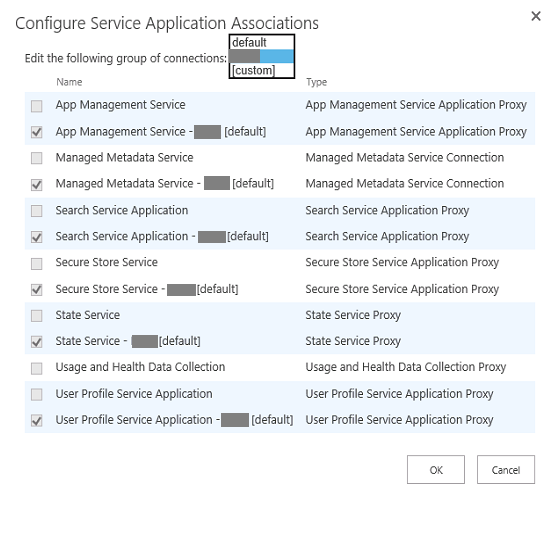 Once you have your new Service Application Proxy Group created, you can then change the web application subscriptions to the proxy groups. To do so, go into Central Administration > Application Management > Web Applications > Manage web applications and select one of your sites. In the ribbon, then select Service Connections under the Management group. 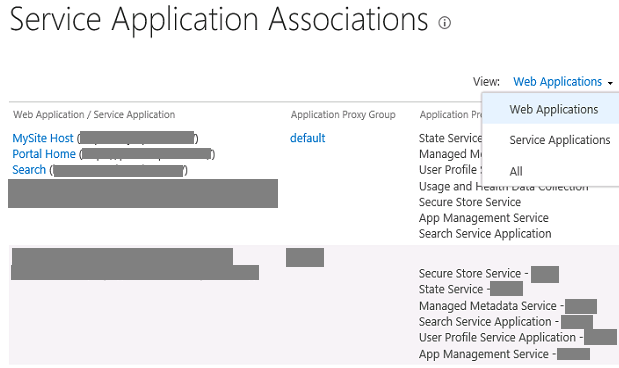 Select the Web Applications view, and then you should see your sites, and their associated applications with their Application Proxy Groups. When you create a new service application, by default, it is going to get tossed into the default group. There is no way in the UI presently to allow you to change associations in the UI once you have created your new proxy group, so, what you need to do is to handle this in PowerShell. The best way to get the IDs for your service applications is to use Get-SPServiceApplication, and then only display the two columns you need, DisplayName (so you know what ones you are looking for), and the Id. This will add the "Secure Store Service – Redacted" Service Application to my new proxy group Redacted. You can see your current license… however, both the input box, as well as the OK button are disabled. and enter in your Product Key and click OK. NOTE: You cannot undo this, so make sure that you want to use an Enterprise key and absorb the associated cost of CALs! As organizations look to the future of their existing SharePoint environments, questions about hybrid deployments come up again and again. 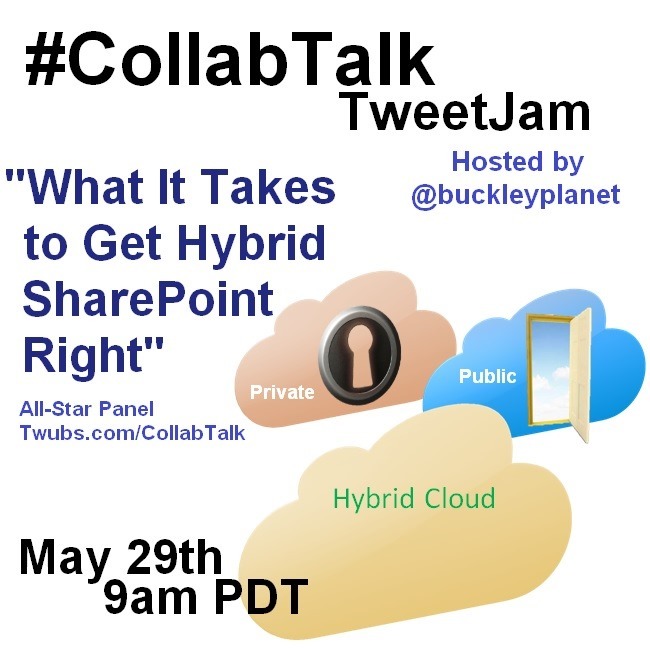 For this month’s #CollabTalk tweetjam, scheduled for May 29th at 9am Pacific / 12pm Eastern we have an all-start panel of experts who will be tackling this topic, answering questions, and sharing their real-life experiences. Our theme will be “What It Takes to Get Hybrid SharePoint Right,” and we want your questions and feedback during this one-hour online event. As organizations begin to seriously consider the future of their existing SharePoint infrastructure, some are moving directly to the cloud and Office365, while others are looking to extend their infrastructure investments, protect sensitive data, and/or maintain the level of control they have over line of business (LOB) integrations and other customizations. 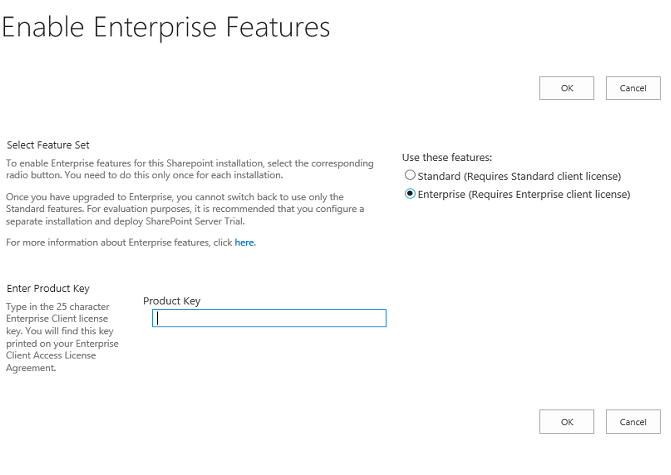 The long-and-short of it is that hybrid SharePoint deployments will be around for some time, and Microsoft will continue to support on premises deployments for the foreseeable future. In this month’s tweetjam panel, we’ll talk about the business reasoning behind the decisions to go hybrid, while also shedding some light on the roadblocks and realities of keeping one foot on prem and the other foot in the cloud. "What It Takes to Get Hybrid SharePoint Right"
As companies transition toward the cloud, how important will hybrid become? What are the most common hybrid SharePoint scenarios? How much of hybrid SharePoint is platform versus services? Is a hybrid search deployment difficult, and if so, what are the pain points? What are the top 3 road blocks for adopting a hybrid SharePoint model? What features/solutions should Microsoft focus on to improve hybrid deployments? What advice would you give to an admin considering a hybrid SharePoint environment? As always, we will have an extensive all-star panel of experts on hand to participate in the conversation and to interact with you directly – but anyone can jump in and participate. So don’t be shy — share your own perspective and company or customer experiences, or just lurk. It’s all good. But be sure to mark your calendars, tell your colleagues, and get involved! I wanted to share a link with my readers that shows a very comprehensive matrix of what features are available across different versions of SharePoint; SharePoint 2007, SharePoint 2010 (no FAST search), SharePoint 2013, and last but certainly not least, Office 365. Richard Harbridge, a Partner Technology Strategist with Microsoft is responsible for this resource, which is a highly valuable one. Please go here to see the comparison chart. I am pleased to announce the first in a series of white papers from Jornata on Future-Proofing your Business. The first in this series – Features, Benefits, and Considerations of Moving to Office 365 is now available on the Jornata website. 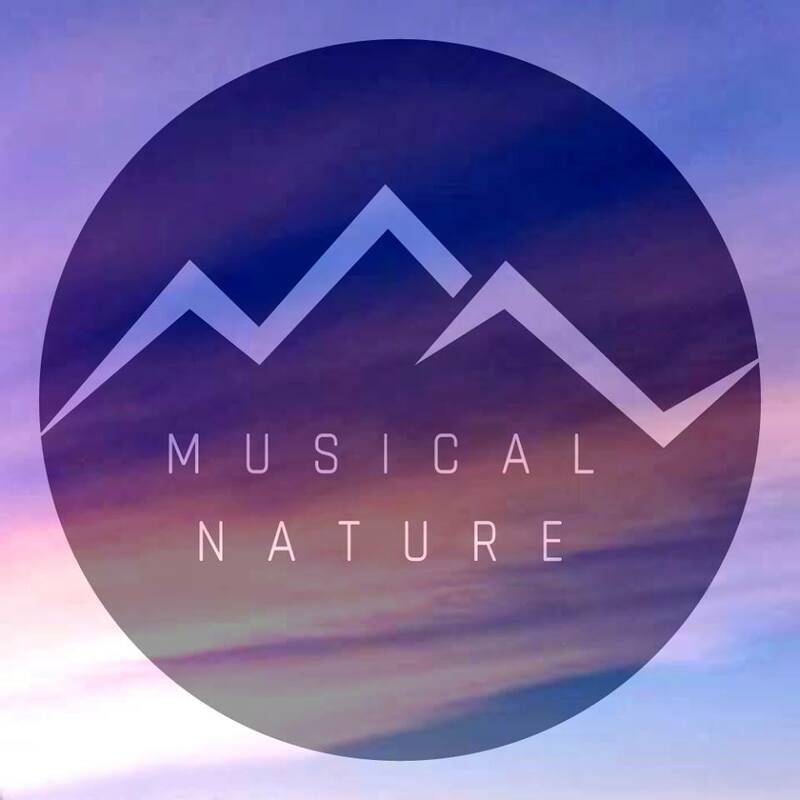 Please feel free to share with whomever you think may be interested in this topic, and watch this space, and the Jornata website for more white papers coming soon!